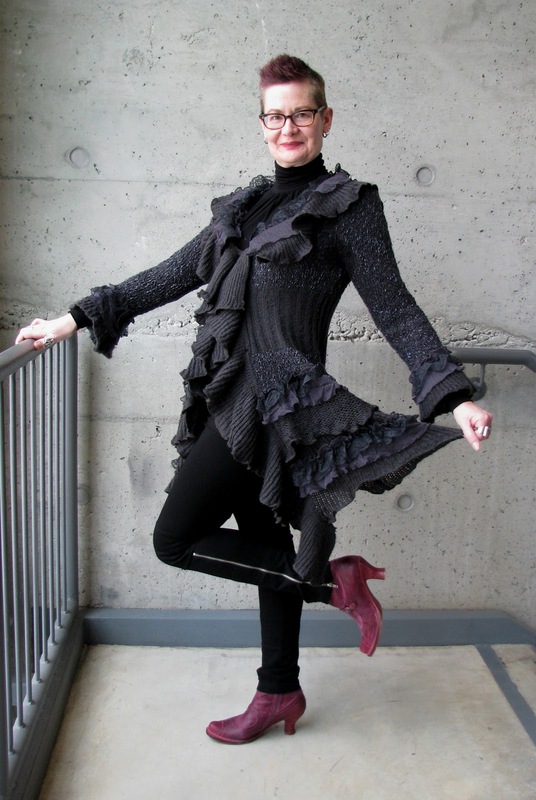 Forest City Fashionista: Ribbons, Ruffles and Lace, Oh My! I found this ruffled sweater coat at a store in Cherryhill Mall called Sara Sohan. I had never heard of it before, but the woman in this post told me she purchased her fabulous pants there so I thought I'd take a look. Most of the clothes are in solid neutrals of black, grey, taupe and have dramatic shapes, tucks and draping. Suffice it to say that it was love at first sight. When I purchased this sweater, the store had much of their merchandise on sale so I think I paid about $35 for it, and when paired with my black zippered leggings and my favourite pink ankle boots, it made me feel like a million bucks. Not a bad return on my investment, I'd say. Okay, so usually comments are effusive and complimentary, as they should be. But when something REALLY strikes you as exceptional, how do you make your point? I caught my breath when I first glimpsed this outfit! It's the perfect silhouette, color, and even price, with the top, zipper leggings, and boots to die for. I would buy them all, wear them all in exactly this configuration, every day. I'm not kidding. I need to move to Canada. I can't believe that was only $35! Awesome outfit. You look radiant! You look like a dancer! The sweater is divine, but the pose is even more spectacular. Grounding this amazing ensemble with pink does make you look like a million bucks. Brava! Love the shape and texture!